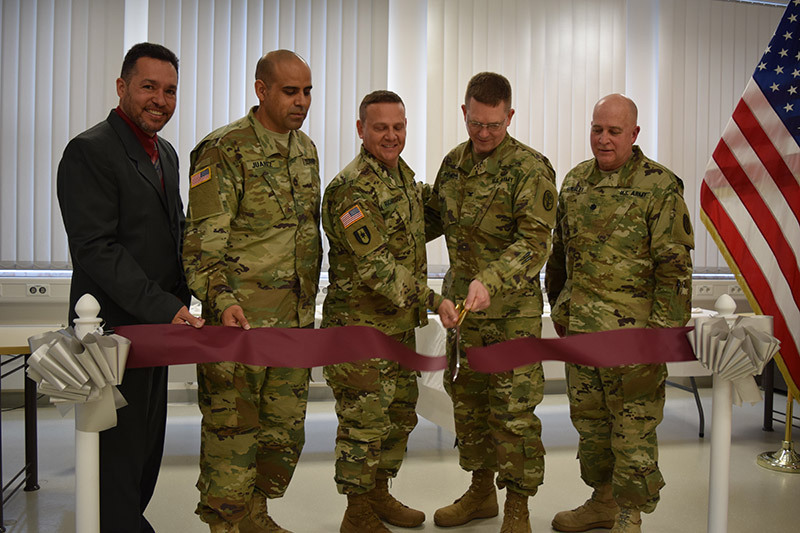 VILSECK, Germany – The ribbon was officially cut on the new U.S. Army Garrison Bavaria Soldier Medical Readiness Center, Friday, at the facility located on Rose Barracks. Commander of the Bavaria Health Command, Col. David G. Richardson, along with BHC deputies and leaders of the SMRC, cut the ribbon in the renovated 2,648 square-foot facility, which was previously a part of the Vilseck Health Clinic before it opened the doors on its new building last year. The SMRC will serve as the principle medical readiness platform in USAG Bavaria, dedicated to the warfighter. It is aimed at responding appropriately, in an agile and collaborative manner, to provide relevant and reliable pre- and post- deployment medical evaluations, enhancing the readiness of Soldiers. The SMRC is designed to ensure the individual Soldier’s medical readiness is up-to-date, while not impacting access to health clinic appointments for beneficiaries within the BHC area of responsibility. The SMRC can process more than 100 troops daily, and has the capability to process required laboratory studies, immunizations, Automated Neuropsychological Assessment Metrics (ANAM) medical evaluations and MEDPROS updates. During the ceremony, Richardson quoted Army Chief of Staff, General Mark Milley, from his message to the Army in which he said readiness is, and will remain, the Army’s number one priority.